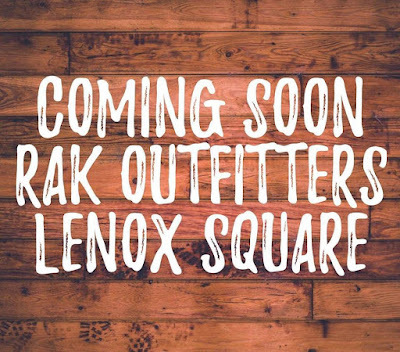 Calhoun-based outdoor retailer RAK Outfitters will open its first ITP location later this month at Lenox Square in Buckhead. The roughly 2,000 square foot store will open on the mall's main level, adjacent to Sprinkles Cupcakes, in a space previously home to Sperry TopSider. RAK has five existing Georgia locations in Calhoun, Fort Oglethorpe, Woodstock, Kennesaw and Dalton. Sources say the current plan is to have the store open next Friday, March 30. A new tea cafe called teamo recently opened in Parkside Shops shopping center on Roswell Road in Sandy Springs. The shop, located next to Egg Harbor Cafe, soft opened earlier this month and is currently celebrating its "grand opening." As ToNeTo Atlanta readers will recall, another tea shop, Sharetea, opened last month in Hammond Springs shopping center across the street near Flying Biscuit Cafe. Aqua-Tots Swim School is opening a new location in place of the former Tuesday Morning at Briar Vista shopping center at the corner of Briarcliff & LaVista Roads. The Mesa, Arizona-based swim school franchise has existing Atlanta area locations in Alpharetta, Douglasville and Kennesaw. Retailer Claire's filed for Chapter 11 bankruptcy Monday, hoping to shed $1.9 billion in debt and close 92 underperforming stores. The chain, which said it operates in 99% of American malls, has been a teen and young girl mecca for much of its nearly sixty year existence. The company, which claims to have pierced more than 100 million ears worldwide, is, like fellow struggling mall-based retailer Sears, based in Hoffman Estates, a Chicago suburb. The chain, which is reportedly dealing with a heavy debt burden, was purchased by private equity firm Apollo Global Management for $3.1 billion in 2007. This past January, Claire's announced a new collection of plush with social media star "Doug the Pug." Surprisingly though, the plush were available only from Claire's online store, seemingly missing a huge opportunity to drive traffic to their brick & mortar stores. Claire's also had a partnership with bankrupt retailer Toys "R" Us where the toy store would sell Claire's branded merchandise within its stores. Georgia Toys "R" Us stores in McDonough, Atlanta and Savannah carried the merchandise, but sources indicate that Claire's is no longer allowing its merchandise to be sold in the stores - fearing perhaps that it won't be paid - and Claire's merchandise was observed roped off and off-limits to customers earlier this week. Of the 92 stores Claire's plans to close, five are in Georgia: Phipps Plaza in Buckhead, Mall of Georgia in Buford, Town Center at Cobb in Kennesaw, Calhoun Premium Outlets in Calhoun, and at Fort Benning. The retailer also operates stores at Northlake Mall in Tucker, Perimeter Mall in Dunwoody and Cumberland Mall in Smyrna, among others. Coming on the heels of last week's news that Toys "R" Us plans to close all of its remaining 735 US stores, former mall-based rival KB Toys may open as many as 1,000 pop up stores this holiday season. The closure of all Toys "R" Us stores means not only that 31,000+ people will be out of work, but also that toy manufacturers need a new outlet though which to distribute their products. Strategic Marks, a company that buys and revitalizes defunct brands, owns the KB name and plans to open the pop-up KB Toys stores in time for Black Friday 2018. After the holiday shopping season ends, the company will decide which of the pop-up stores will become permanent, based on their performance and whether an extended lease can negotiated. KB Toys closed all of its stores in early 2009. In late 2009, Toys "R" Us purchased KB Toys' brand, including its web site, trademarks and intellectual property. Strategic Marks bought the KB Toys brand from Bain Capital in 2016. Bain is the same company that bought Toys "R" Us and took it private in 2006. ToNeTo Atlanta was tipped off in early November that George Lefont had sold his Lefont Sandy Springs movie theater to a local entreprenuer. We failed to do a proper post in a timely manner and for that we apologize. That said, our friends at Reporter Newspapers in November and more recently, Atlanta Magazine, published excellent stories on Lefont's movie theater history in metro Atlanta and plans for the The Springs Cinema & Taphouse, the new concept being opened in place of Lefont Sandy Springs by East Cobb resident Brandt Gully. Red Pepper Taqueria is now open in TOWN Brookhaven. The restaurant, which ToNeTo Atlanta first announced in January would replace Jefe's Tacos & Tequila, opened Tuesday for dinner with plans to add full bar and lunch service later this week. This marks the third Red Pepper, joining existing locations on Briarcliff & LaVista Roads near Toco Hills and on Piedmont Road near Peachtree Road in Buckhead. A new Candlewood Suites hotel that was first proposed in 2014 may finally be heading towards the start of construction. The hotel, planned for 2250 Corporate Plaza in Marietta, would replace an existing but empty office building constructed in 1986. The five-story hotel, as planned, would provide 93 rooms on 1.17 acres. The new hotel is about one and half miles from SunTrust Park. Candlewood Suites is an extended stay brand from IHG, whose North American headquarters are in Dunwoody. There are currently Atlanta area Candlewood Suites hotels in Athens, Augusta, Columbus, Duluth, Lithia Springs, Macon, Savannah, Valdosta and Warner Robins. Yesterday, Vantage Realty Partners announced the first three tenants for their 75 Airline Street project. Bordering Old Fourth Ward, Inman Park and Cabbagetown along Atlanta’s BeltLine, the 28,000 square foot project is set to open next spring and will boast two new concepts as well an intown expansion for another. Cold Beer, a new concept from Atlanta chef/author Kevin Gillespie and his Red Beard Restaurants, is already seen as the most exciting concept. Described as the sister to Gillespie’s Gunshow restaurant, Cold Beer will feature a beverage program from mixologist Mercedes O’Brien along with a menu of shareable dishes. The restaurant will feature a patio on the roof and two patios adjacent to the BeltLine. The second new concept, Hazel Jane’s Wine & Coffee, is a wine and coffee bar from the makers of Revelator Coffee and Buckhead's The Mourning Dove. Hazel Jane’s wine and beverage program will operate under the direction of certified sommelier Melissa Davis (Staplehouse, Cakes & Ale). The day-to-night location will feature a full-service kitchen, a coffee and espresso counter, a large central bar in the heart of the space, and a convenient BeltLine adjacent patio & bottle shop. Shake Shack, the popular burger joint from award winning restaurateur Danny Meyer, will also open its third location in metro Atlanta in the project. Designed by Smith Hanes, the Shack will be constructed to reflect the Old Fourth Ward’s charm, using recycled and sustainable materials, booths made from lumber certified by the Forest Stewardship Council, and tabletops constructed from reclaimed bowling alley lanes. The new Shake Shack joins the New York-based restauant's existing locations in Buckhead at The Shops Buckhead Atlanta and in Dunwoody at Perimeter Mall. Buford Highway Chinese restaurant Chef Liu, best known for its dumplings, has temporarily closed, according to a sign on the eatery's Pinetree Plaza door. A ToNeTo Atlanta reader indicated that the popular Buford Highway restaurant was closed with a "stop work order" affixed to its front door. The stop work order, dated March 8, 2018, stated the restaurant was in violation of City of Doraville code 5 - 1 (a) or non-permitted construction work. A sign on the door from the restaurant indicates they plan to reopen "soon." In late 2009, Chef Liu relocated from its original home, a former Baskin-Robbins shop in a freestanding outparcel of the center (now Little Caesar's), to an inline space previously occupied by Asam House. Chef's Liu's phone is currently disconnected. Moe's Southwest Grill is seemingly about to test a new logo. The Atlanta-based restaurant chain, a division of Focus Brands, has filed to trademark a new logo. The new logo was filed earlier this month with the U.S. Patent and Trademark Office. "Moe’s Southwest Grill is testing a new store design and the logo is one component of that," Moe's spokesperson Lindsay Haynes told ToNeTo Atlanta in an email. "We will have more exciting details in the coming weeks." Moe's has used an iteration of its original logo since inception, currently with the restaurant's name in red letters on a circular yellow background. The first Moe's opened on Peachtree Road in Buckhead in 2000. The concept was purchased by FOCUS Brands, a division of Roark Capital Group, in 2007. FOCUS also owns the Cinnabon, Schlotzsky's, McAlister's Deli, Auntie Anne's and Carvel franchises. FOCUS debuted a new Cinnabon store design and logo at North Point Mall in Alpharetta in late 2015. In late 2016, the company debuted "Schlotzsky's Austin Eatery" an "upmarket" version of their Schlotzsky's concept, at Sugarloaf Marketplace in Duluth. Well placed sources indicate that the company will debut a new store design and logo for McAlister's Deli at Fuqua Development's upcoming Kroger-anchored center at Northside Drive and 17th Street. Grindhouse Killer Burgers plans to open their new Grant Park restaurant at 701 Memorial Drive Monday April 2, according to a Facebook post from owner Alex Brounstein. The Memorial Drive location is the seventh overall Grindhouse restaurant joining the first at the Sweet Auburn Curb Market and subsequent locations in Piedmont Heights, Athens, Decatur, and a pair of locations at Hartsfield-Jackson Atlanta International Airport. New poke eatery Pokèyaki last Friday celebrated its grand opening at Dawson Crossroads in Dawsonville. Pokeyaki serves poke bowls and teriyaki and brings an ethnic offering to a center largely home to traditional American chain restaurants such as Chili's and Freddy's Frozen Custard & Steakburgers. Developed in 2016, Dawson Crossroads is located on the southeast corner of GA 400 and Dawson Forest Road, adjacent to North Georgia Premium Outlets and is anchored by Publix Supermarket. Farm Burger plans to open its newest Atlanta area location next Monday, March 26 at The George, a new apartment building on Memorial Drive in Grant Park. At The George, Farm Burger joins Your Pie, a quick-serve pizza franchise which opened this past December. The first Farm Burger opened in Decatur in 2010. Since then, the mini-chain has added local restaurants in Buckhead and Dunwoody as well as grown out of state more recently. The first out-of-state Farm Burger opened in downtown Asheville, North Carolina in 2013. This past year, Farm Burger opened at Crosstown Concourse in Memphis, Tennessee and at The Waites, a new apartment community in downtown Birmingham, Alabama. Previously, Farm Burger opened out-of-state locations in Berkeley and Marin, near San Francisco, California, Huntsville, Alabama, Nashville, Tennessee and a second location in Asheville. Farm Burger is also expected to open at Peachtree Corners Town Center, the new Fuqua Development in Peachtree Corners, late this year or early next year. A "limited" satellite location opened at Mercedes-Benz Stadium in downtown Atlanta last year. The location is limited in the sense that it only offers a couple of burger and fry options, not the full Farm Burger menu. SMH. Leave the Moe's logo alone - the new one is boring & sterile. Elementary school artists could come up with something better. Well, the original Moe's logo DEFINITELY looks like an elementary school drew it, so I guess it's apropos. It's about time Moe's had a stronger logo. I like the color scheme better too. I agree the new logo looks like crap! The old one is easily identified separating itself from others. That new logo at a fast/quick glance looks like a logo for shoes made in Arizona. Stupid move. My first thought about the new logo was also "Tostitos logo"! At least Moe's won't be going the "T Mac" route. 'Cause that worked out so well.